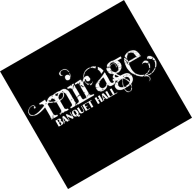 When you step inside Mirage Baquet Hall, you leave the ordinary outside. With space for up to 600 guests in an elegant and affordable venue, your guests will be amazed! Unfortunaltey due to consistent increasing food, beverage, and utility costs we have been forced to recalibrate all menu prices. This is the first complete overhall of the menu since our opening 10 years ago. This is effective on all events after July 1, 2019 regardless of when the event was scheduled. All pricing on the website has been updated including the downloadable menu. Please do not hesistate to contact us with any specific questions.